Have you ever wondered how fresh the fish you buy at the grocery store is? I’ve often wondered, but there really was no way the average consumer would know right? That was the case until recently! I purchased fish this past week and I know exactly when it was caught, where it was caught and who caught it! You can find out all this information without ever leaving the grocery store. How do you find out all this information? All you have to do is scan the QR code found on the packaging with your smartphone. If you don’t own a smartphone (like me), just visit www.compliments.ca/madewithcare and input the unique code from the package. 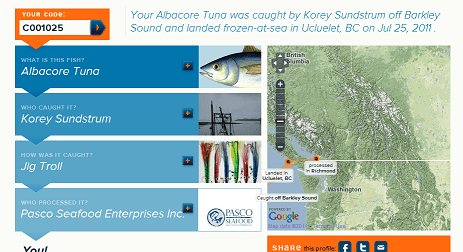 Check out the wealth of information I received about my Sensations Wild Albacore Tuna Portions! If I wanted to, I could even send a note to the fisherman who caught my dinner! John and I went to Sobey’s this past week and purchased the Sensations by Compliments Albacore Tuna Portions and the Sensations by Compliments Wild Sockeye Salmon Fillets. We had a lovely fish dinner and I pan fried the tuna and the salmon fillets in rosemary olive oil. John’s not a big fish fan, but he devoured these. They turned out perfectly! I definitely liked being able to learn more about the food we eat. I think it’s a great tool to aid shoppers in making informed decisions about their food. I’m going to keep my eye out for the other packages at Sobeys so we can give those a try too. Next time, you visit Sobeys check for this product in the frozen fish aisle and give them a try. If you own a smartphone, make sure to scan the QR code on the front of the packaging too! One Canadian reader is going to win a $30 Sobeys Gift Card so you can try out the fish too! The GC can be used also at IGA, Foodland and Price Chopper. I’d totally go for the sockeye salmon. Sobeys always has a lovely seafood display. I”m nuts about Halibut so I’d go for that one…. I would buy the Wild Pacific Halibut Fillets. I’d go for the sockeye salmon. That’s the only fish my husband will eat! I’d get the Wild Black Cod fillets! I would choose the halibut. I would likely purchase the Wild Albacore Tuna Portions. I would love to try the Sensations by Compliments Wild Pacific Halibut Fillets! 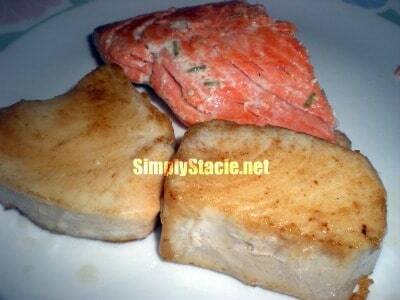 I would by the Sockeye Salmon Fillets. I would buy the Sensations by Compliments Wild Sockeye Salmon Fillets..hmm..yummy salmon! I would definitely try the Sockeye Salmon. Yum! I would definately buy the Cod! YUMMY!! I would buy the Pacific Halibut! Yummy and what a cool giveaway!!! I would try the Sensations by Compliments Wild Sockeye Salmon Fillets. I would choose the Sensations by Compliments Wild Sockeye Salmon Fillets. Sensations by Compliments Wild Sockeye Salmon Fillets looks good. I LOVE Tuna so I would definitely get the Wild Albacore Tuna Portions. If I won, I would buy the Wild Sockeye Salmon Fillets. I just love them. I’d get the sockeye salmon. Salmon. Thew whole family loves it. I’d buy the salmon, as that’s my dh’s favourite fish. Sensations by Compliments Wild Black Cod Fillets! MmMmMM sounds good! I would probably try the halibut. I would probably get the Wild Sockeye Salmon Fillets. My family loves salmon. 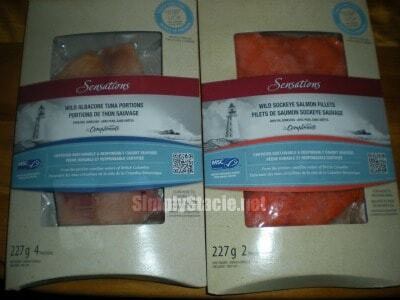 I would likely buy the Sensations by Compliments Wild Pacific Halibut Fillets…it has such a nice flavour. I’d have to choose the Wild Sockeye Salmon Fillets too – my favourite. I’d like the Compliments Wild Sockeye Salmon Fillets. I would try the Sockeye Salmon! I would try the Wild Black Cod Fillets. I would choose the Wild Pacific Halibut Fillets. Most of the time that is the type of fish we eat. I think it is great that you can get all the information about their products. There has been so much in the news about fish in contaminated waters and even in some fish ‘farms.’ It would be great to know exactly where your fish came from and all the other details as well.